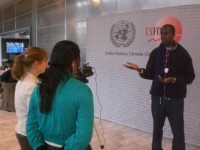 Ebrima is an Environmental and Sustainable development specialist with 10 years of experience. He works on environmental governance, Biodiversity conservation and project Management. Ebrima is also social entrepreneur and a writer. He is the founder and CEO of Gamjobs.com, The Gambia’s first career website and the Author of the Book: Jande Pulaar. Ebrim has strong passion for social rights, including women rights, right to education for all. He speaks fluent English, French and Spanish. He holds a Bachelor of Science degree in Agriculture and minor in Biology and master of science degree on Environmental Economics and Social sustainability, specializing in science and management of global change. Ebrima’s most recent work was Project Administrator for the international charity, Doctors Without Borders in Niger, West Africa, He is currently working on project WIFE project Gambia, which supports and engages rural women in climate-smart Agriculture gardening and agro-entrepreneurship. Research Poster: Effects of Climate Change-Induced Sea level rise; the case of Gambia’s Southern Coastline.